Skoda Scala enters production at Mlada Boleslav, Czechoslovakia. The Scala is Skoda’s first car based on MQB A0 platform. It is also the first car to borrow design cues from Skoda’s Vision RS concept. Sales of the Scala to start in second quarter of 2019 in Europe. Skoda has started production of its first car based on the all new modular MQB A0 platform, the Scala, at its mother plant in Mlada Boleslav, Czechoslovakia. Unveiled in Tel Aviv late last year, the Scala marks the ‘next development stage’ of Skoda’s design language and is the brand’s first car to emulate the design of the Vision RS concept study. 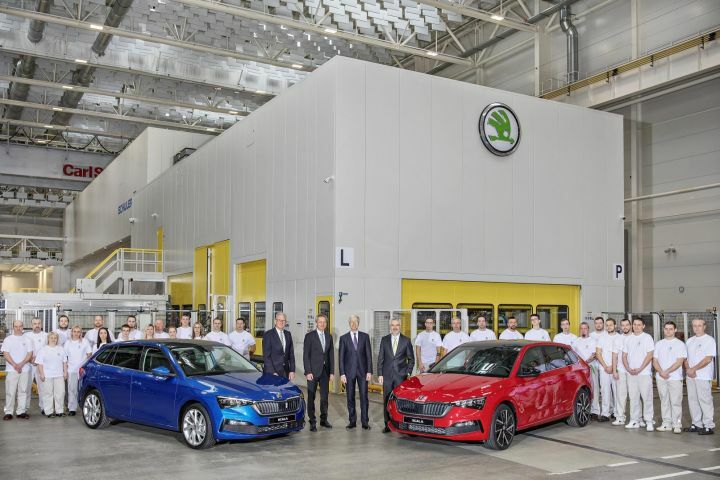 Built and designed at the carmaker’s headquarters in Mlada Boleslav, the Scala is positioned between the Octavia and Fabia globally and will be on sale in the second quarter of 2019 all across Europe. Overall, the Scala looks less like a traditional hatchback and more of an amalgamation of a hatchback, a sedan and an estate. In size, it’s nearly as large as a VW Vento but maintains the compact proportions of a hatchback. Thanks to its unique dimensions, Skoda claims that the Scala is as spacious, if not more, than the current Octavia -- and that is quite something. It also gets a massive 460-litre boot, which can be expanded to 1410 litres with the rear seats collapsed. Alongside the acres of space available inside, the Scala gets a 9.2-inch touchscreen infotainment system with Android Auto, Apple CarPlay and MirrorLink. The new Virtual Cockpit instrument cluster seen in the Superb and the Kodiaq is also available. Skoda has also loaded the Scala wit a host of safety and driver assist systems normally seen in premium cars, such as 9 airbags, lane assist, front assist (auto braking), side assist (blind spot detection), rear traffic assist and hands-free park. Under the bonnet, the Scala gets a lot of powertrain options. These include a 1.0 litre TSI in two tunes, 95PS or 115PS; a 1.6 litre, 115PS diesel; and a 90PS CNG. There is also a range-topping 1.5 TSI petrol which makes 150PS and 250Nm. Transmission duties are done by either a 6-speed manual gearbox as standard or the optional 7-speed DSG automatic gearbox. For now there is no official word on when the Scala will make it to our shores. But what we know for certain is that Skoda is considering getting it here. If brought here, it is unlikely to be a volume player, possibly coming in through the CKD route. In India, the Scala will slot in between Rapid sedan and the Octavia, and could carry a premium price tag upwards of Rs 12 lakh, which could be a pricey prospect for a hatchback. However, the Scala is likely to share most of its design cues with a compact SUV in the Creta’s segment, which Skoda has confirmed will come to India in 2020. So what do you think about the Scala? Would you be willing to shell out premium bucks for a large hatchback? Do let us know in the comments section below. Share your experiences with Scala?